Houghton Mifflin Harcourt, 9780544663312, 256pp. Fans know Richard Blais best as the winner of Bravo's Top Chef All-Stars, the first competitor to be invited back as a permanent judge on Top Chef, and now as a Food Network regular as well. On television, Blais is famous for his daring cooking, making use of science (think liquid nitrogen) to dazzle and impress. But how does he cook at home when the cameras are off? That's what this book will answer, with elevated homestyle recipes and personal stories which invite you behind the scenes and into his own kitchen for the first time. Some recipes might look familiar, like spaghetti and meatballs, but have a secret, flavor-boosting ingredient, and others feature clever but unexpected techniques, like his fried chicken which is first marinated in pickle juice. These are creative recipes that anyone can make and are sure to excite, from Seabass with Ginger Beer and Bok Choy to Jerked Spatchcock Chicken and Plantains, making this this the book Blais fans have been waiting for. 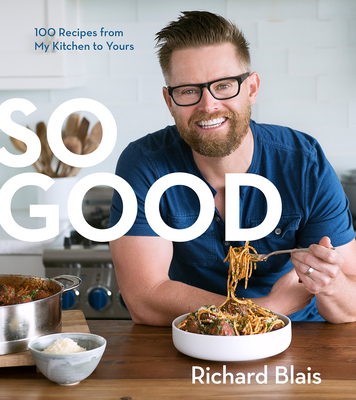 Perhaps most recognizable as the winner of Bravo’s Top Chef All-Stars and now a regular judge on Top Chef, as well as a rotating judge on Fox's hit show Master Chef, RICHARD BLAIS is a successful chef, restaurateur, James Beard Award-nominated cookbook author and television personality. After graduating from the Culinary Institute of America, he went on to train at some of the world’s most esteemed restaurants, including The French Laundry, Daniel, Chez Panisse, and el Bulli. Blais then relocated to Atlanta to oversee a local seafood concept, and his creative approach to cooking and cuisine led to the establishment of Trail Blais, Inc., a culinary company that has consulted on, designed, and operated multiple locations Flip Burger Boutique in Atlanta, Birmingham, and Nashville, and Juniper & Ivy and The Crack Shack restaurants in San Diego, where he now resides. Blais’s debut cookbook, Try This at Home: Recipes from My Head to Your Plate, was a finalist for a James Beard Foundation Award. Blais regularly appears as a host and judge on Food Network on programs such as Guy’s Grocery Games, Cutthroat Kitchen, Celebrity Food Fight, and Rachael vs. Guy. He has appeared on the TODAY Show, Good Morning America, The Rachael Ray Show, The Chew, The Talk, and Late Night with Jimmy Fallon, as well as in numerous publications including the New York Times, Wall Street Journal, Food & Wine, Bon Appétit, People, InStyle, and more. He lives in California.